This week's blog post takes us back to Wood Farm Camp near Malvern. I've managed to source some pictures of the Dutch soldiers who stayed here during 1945, to add to the information sent to me by an anonymous researcher a couple of weeks ago (for the full blog entry on this topic, click here). I hope you like the pictures: as usual, if you have any memories or recollections of your own to add, please don't hesitate to get in touch via the comments below! 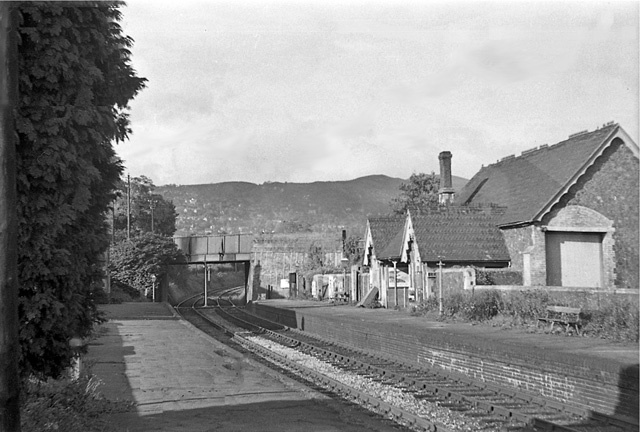 Malvern Hanley Road station in 1951. Used courtesy of Ben Brooksbank via Creative Commons. Ben's article is too long to post here in its entirety, but I have nonetheless selected some quotes about the Malvern-Ashchurch railway that people might find interesting. I hope you enjoy reading it as much as I have. For those of you who are keen to see more, Ben's entire photo collection is available and free to use (via a Creative Commons licence - please respect these terms when using pictures!) on Geograph.co.uk, where a facility to contact him can also be found, should you feel the need. "...especially after being given a bicycle – albeit one with no gears, Ashchurch was easily accessible to me, being only four miles from my father’s farm at Shuthonger. For the greater part of my School Holidays, or about 10 weeks of the year, I was able to witness the traffic on the Birmingham - Bristol line, but of course in practice I saw it only for a few hours on a few days and then mainly only in 1942-45 – an infinitessimal fraction of the total on a busy main line operating 24/7 (almost)! My father allowed me to go there, for stints of several hours, provided I was not needed for farm-work or something. I would take sandwiches and enjoy the comings and goings, and read a good book in the intervals. The intervals were short, as the main line was usually busy and there were movements on the branches, including the occasional, seemingly incongruous, passing of a light engine or empty Evesham line train over the flat crossing at the north end. I preferred the seats on the Up Main platform, where incidentally there was a Pub, celebrated for being a rarity in those days, being leased to a private owner and not run by the Railway. By comparison, the traffic on the branch line from Ashchurch via Tewkesbury to Great Malvern, which ran along a few hundred yards below the house, remained very sparse and predictable. This branch was most unusual in that, although double-track, between Tewkesbury and Upton-on-Severn only the Down line was used for traffic, operated by train-staff and ticket and no signals: the Up line was dedicated to storage of wagons, also occasionally some carriages, while in 1943-44 there were new US Army wagons awaiting transfer to the Continent. There were just four passenger trains each way per weekday, plus one extra on Thursdays and Saturdays, and three others just between Tewkesbury and Ashchurch – none on Sundays; there were two goods trains to Malvern from Ashchurch and one train back. It was busier between Ashchurch and Tewkesbury, in particular because there was an engine shed at Tewkesbury, to which various locomotives - up to the size of Stanier Black Fives - came for servicing after bringing trains to Ashchurch. Before 1944 I was unaware of any other traffic on the Malvern line, apart that is from the fairly frequent occurrence of a 3F or 4F 0-6-0 early on Sundays, which would wake me up as it struggled to yank as many empty wagons as it could – many having seized-up grease axle-boxes, from the miles-long collection of spare wagons stored on the former Down line. 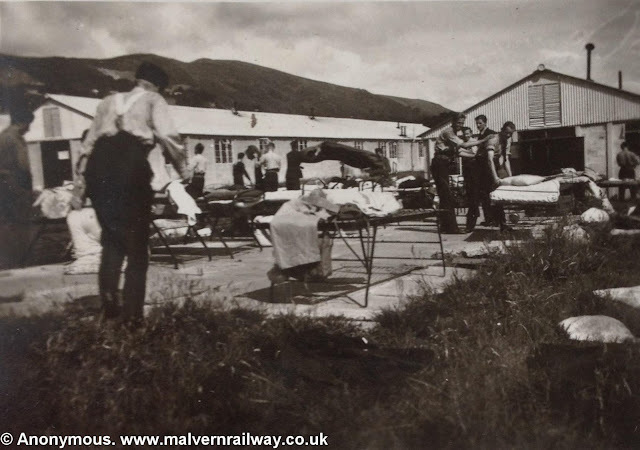 After D-Day in 1944, however, US Army Hospital trains came up from Ashchurch to Malvern with wounded soldiers going to the Military Hospitals, of which five were built near Malvern Wells (LMS) , the empty stock being returned via Worcester up the main line. These trains would be double-headed, often with two 4F 0-6-0s and also by the specially dedicated LNER Westinghouse-fitted B12/3 4-6-0s." "...in the afternoon of 26 April (Wednesday) I spent 5½ hours at Ashchurch and saw 40 workings. Eleven were main-line passenger workings - including on the Up not only the Inspection Saloon with 2P No. 501 of Walsall (3C) that seemed to come along almost daily, but of another with No. 526 (17A). There were 20 main-line freights, which included five on the Evesham line, three of them to/from the Depot, two being GWR (with 2-6-0 No. 8388 and 0-6-2T No. 5662). The Down OP due at 14.18 was 48 minutes late (with 3P No. 745) and the 10.20 ‘EP’ York – Bristol passed almost as late with Patriot No. 5540 ‘Sir Robert Turnbull’ from 5A; the Down OP due 17.00 was a half-hour late. Later, two LNW 0-8-0s (No. 9329 of Huddersfield (25B) and No. 9219 of Springs Branch (10A)) passed each other in the station on freights; also Western Division 8F No. 8174 (1A) was on the usual Up ‘vegetables’ train. It was a hectic day, and one Down freight was held in the loop for two hours. 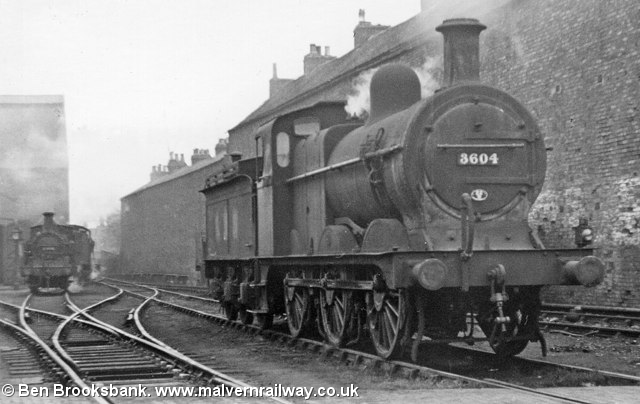 The following day, while working on our farm I saw a Hospital Train (W546 ) come down from Malvern with 2P No. 512 + 4F No. 3876 – so the American Military Hospitals near Malvern were already in operation. On Friday 28 April, I spent 4½ hours at Ashchurch in the morning and noted 42 workings. Only 10 of these were main-line passenger, but 14 were freights on the main line, two being GW-hauled, with 2-8-0 No. 3844 and 4-6-0 No. 5997 ‘Sparkford Hall’. Freights or LE in/out of the Depot numbered at least six: one with GW 2-8-0 No. 3818, the others with ordinary LMS 0-6-0s. A Grimesthorpe (19A) Jubilee (No. 5652 ‘Hawke’) was on a Down Troops (D11) and 5A Patriot No. 5540 ‘Sir Robert Turbull’ passed again, on Up Special e.c.s. A 4F (No. 4040 from Belle Vue,19E) brought a train of empties from Tewkesbury, went round it then took it up the main line. Nottingham (16A) 8F No. 8282 was on an Up freight and Walsall (3C) 4F No. 4068 was on Up empties. At least two engines turned by using the triangle over the flat crossing. All this activity did not seriously impede the normal – if exiguous – passenger traffic, except the 08.35 OP from Birmingham via Evesham turned up nearly an hour late (with Bushbury (3B) 2-6-4T No. 2489). Once again, a Down freight was held in the loop for over two hours. It was hard for me to drag myself away for lunch." "...on Sunday August 6th, I and my friend bicycled to Worcester and spent nearly four hours up on the Railway Cliff. We saw what we could of the engines at the Shed without actually going inside, and I noted:- 4-6-0 Nos. 4903 ‘Astley Hall’, 4953 ‘Pitchford Hall’, 5914 ‘Ripon Hall’, 5929 ‘Hanham Hall’, 5958 ‘Knolton Hall’, 6922 (‘Burton Hall’ in 12/46); 2-8-0 Nos. 3026/43/9, 3811/26, USATC 1609, 2294, 2422/35; 2-6-0 Nos. 2635, 5313/32, 6312/43/96, 7308; 0-6-0 Nos. 2263/78, LNE J25 2051/72, 2136; 2-8-2T No. 7237; 2-6-2T Nos. 5114/22/73; 0-6-2T No. 5626; 0-6-0T Nos. 1796, 2007, 2101, 2774, 4641, 7750, and WD 1426; Diesel railcar No. 5. (There were a number of other locomotives I did not identify). Being a Sunday – the traffic was very light, even at this stage in the War. However, we saw 12 workings and most were interesting. Firstly, one of the perambulating LNER B12/3 4-6-0s (No. 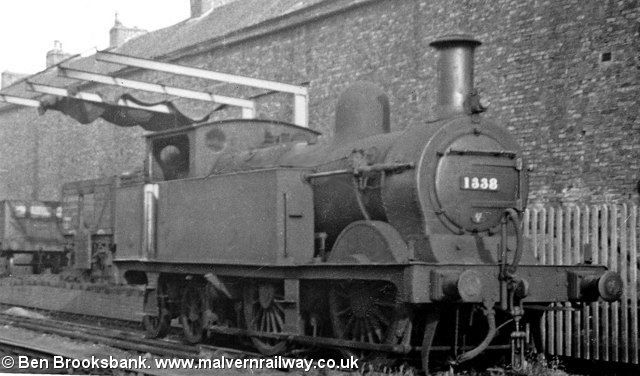 8549) used on US Army Hospital Trains came LE from the Hereford direction, presumably from Malvern Wells: then, without our seeing, it must have turned on the triangle and perhaps refuelled, for later it returned again from the Malvern direction with its Hospital Train piloted by MR 4F 0-6-0 No. 3912 (21A). There were no freight trains, but USA S160 No. 2443 passed LE and there were two Specials: one with GW No. 5041 ‘Tiverton Castle’, the other with Black Five No. 4804 (22A)." "...my next session at Ashchurch was on January 2nd (Tuesday), when I spent 2½ hours in the afternoon and noted 21 workings (eight freight), the only noteworthy train being a Hospital Train to Malvern with 2P No. 630 (22B) piloting 4F No. 4532 of Kentish Town (14B). Next, an identical spell on Friday January 5th produced only 16 workings (five freight) – rather ‘boring’ except for two Up Specials, one with 2P No. 634 (22A), the other with nearly new Black Five No. 4842 (21A). When I returned via Birmingham to Euston on January 8th there was plenty of freight to be seen before Birmingham: two 8Fs and nothing ‘exotic’ - only 3A Black Five No. 5499 and Belle Vue (19E) 4F No. 4261 being of note. It snowed hard and my train up to Euston was overcrowded as ever. I was unable to see out and heavy snow caused the train to be two hours late into London – not excessive by the standards of the WCML at that time." "...a Saturday afternoon (14.35–18.20) session at Ashchurch on 14 April differed only from the previous year in the absence of traffic to the Depot, for there were only 27 workings (12 freight). Notable were an Up Hospital(?) Special to the Malvern line with 4F No. 4466 (22A), which returned LE later from Worcester; one Up Special (with Black Five No. 4804 (22A)), one Down freight had a (rare) Stanier 2-6-0 (No. 2961 from Crewe South (5B)), one had GW 2-8-0 No. 2801 and another had a 2F 0-6-0 (No. 2989); the Down OP due 14.18 was only 20 minutes late(!)." This week's blog post (my 100th, incidentally!) comes courtesy of an anonymous historian in the Netherlands, who has compiled a history of the time spent by Dutch soldiers in Malvern Wells during 1945. 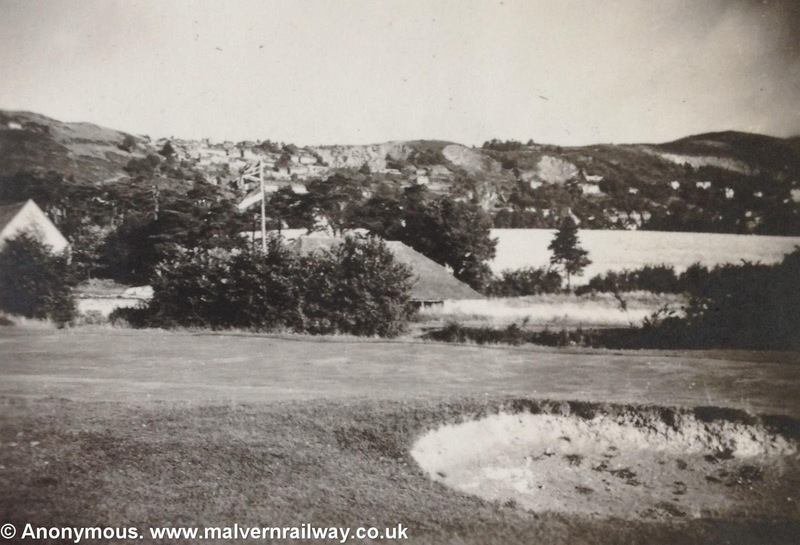 Included are some fascinating comments about the railway at Malvern Wells and the activities of the soldiers in Great Malvern during their time off. The author has asked me to pass on any messages or recollections from my readers about Dutch soldiers at Wood Farm Camp or Blackmore Camp, so do please leave these in the comments section at the bottom of this page if you know anything which may prove useful. The presence of Dutch troops in wartime Malvern Wells has been a well-kept secret for many locals in the Malverns. Based on the diary of Dutch war volunteer private F.J. Remmers (Military Aviation KNIL) and some additional research, I have tried to reconstruct their story. The initial plan for these Dutch troops of a short transit visit to Malvern Wells en route to Australia was dramatically changed due to the unexpected capitulation of the Japanese on August 15th, 1945. The Australian Government was no longer willing to support the re-establishment of Dutch colonial rule in a liberated post-war Indonesia. By this time up to 3,000 Dutch troops had arrived in Malvern Wells and they became stuck there, mainly for political reasons. During March 1945 the southern part of the Netherlands was being liberated by the Allies. Within the liberated areas thousands of young Dutch men enlisted as war volunteers (OVW-ers) to fight against the Germans, or against the Japanese in order to liberate the Dutch East Indies and to re-install Dutch colonial rule. The majority of these initial volunteers during this period would finally end up in the “Gezagsbataljon voor Indië” (GBI). The GBI was intended as a combat unit to fight the Japanese in the Far East together with the Allies. The initial plan was to raise 15 GBIs who would be trained for tropical warfare by Free-KNIL instructors in Australia (KNIL = Royal Dutch East Indies Army). During the war the Australian Government had opened its borders for Dutch troops in an attempt to halt a Japanese invasion. In the summer of 1945 most European nations were demobilising their troops based in the United Kingdom, while the Netherlands started to increase troop numbers drastically. On May 4th, 1945 the first detachment of the GBI (94 men) departed from Holland to the training camp of the Free Dutch Army in Wrottesley Park near Wolverhampton, followed by a second group of 125 men on May 31st, 1945. Both groups merged into a single company (the so called First Detachment GBI) which left for Sydney Australia together with 320 men and women of the Netherlands Indies Civil Authority (NICA), Women’s Corps KNIL (VK-KNIL) and some planters on June 20th, 1945. This camp had its orders to transit the 15 future GBI Battalions and other volunteers. On July 7th, 1945 KNIL Captain A.L. Nouwens visited Malvern Wells to take over Wood Farm Camp, a former hospital camp of the 93rd American Hospital. The Dutch Ministry of Overseas Territories (MINOG) had rented this vacant camp to serve as a transit camp for KNIL volunteers en route to Australia. Meanwhile, the Dutch camp at Wrottesley Park would also remain in use as a training camp for Dutch war volunteers. 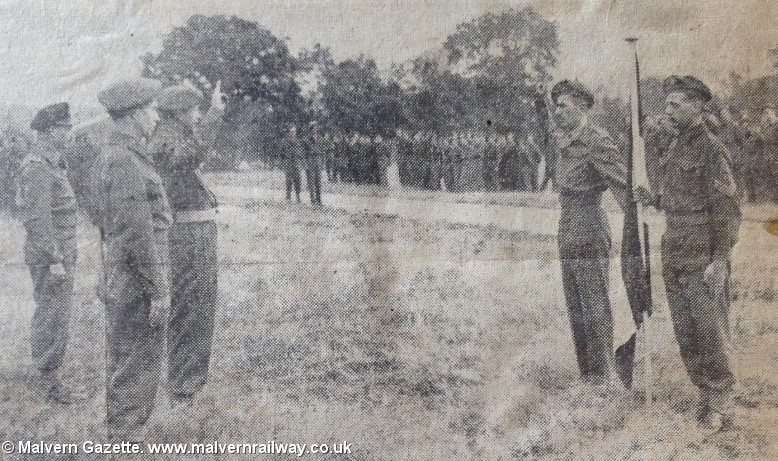 In the period July 25th to August 17th, 1945, over 2,500 troops arrived in Malvern Wells, consisting of over 1200 GBI-volunteers who arrived in four transports by train on August 17th, 1945 (the so-called second detachment GBI). The GBI was under the command of KNIL Major of the Cavalry E. Steenhouwer, who had been a teacher at the HKS (High Military College) before the war. A detachment of 400 men from the Air Force (LSK) also arrived by train on July 27th, intended as reinforcement of the Military Aviation KNIL squadrons within the Royal Australian Air Force (RAAF), as did 600 militarised persons for the Netherlands Indies Civil Administration (NICA), 260 KNIL Lieutenants and Cadets, and 42 women destined for the Women's Corps KNIL (VK-KNIL) which was founded in Australia in 1944. Some of the cadets and lieutenants were even married with members of the VK-KNIL detachment. The Dutch Government had named the group in Malvern Wells the “Europe Detachment KNIL”. 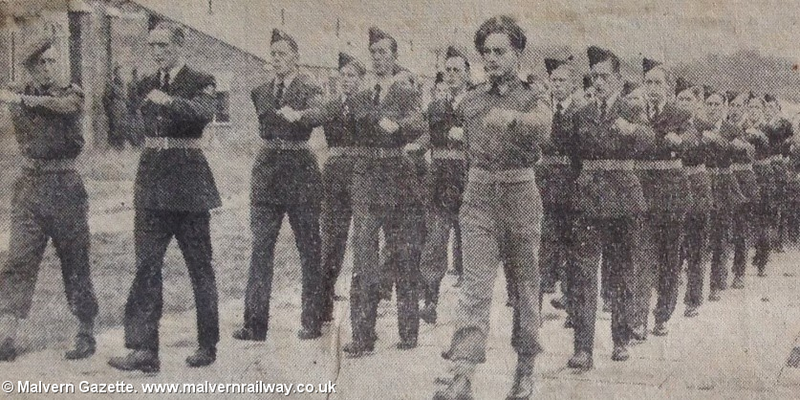 By the end of August 1945, according to the Malvern Gazette, this group had grown to 3,000 men and women. Wood Farm Camp was under the command of KNIL Lieutenant-Colonel of Engineers G.W.J van Walraven. Second in command was KNIL Major of Infantry A.L. Nouwens, who had only recently been promoted to Major on August 21st 1945. The former British commando Lt. E.L. Ward acted as the British liaison officer. Both KNIL officers G.W.J. van Walraven and A.L. Nouwens had been assigned from the KNIL (Royal Dutch East Indies Army) to the Netherlands to act as teachers at the KMA (Royal Military Academy) in Breda in 1940. When the Germans invaded the Netherlands on May 10th, 1940, there were 555 cadets in training at the KMA (Royal Military Academy) in Breda, of whom 243 were destined for the Royal Dutch-Indies Army (KNIL) and 312 for the Army in Holland (KL). On July 15th, 1940 the Dutch army was disbanded by the Germans. Despite the fact that no exams had been taken, the third year KNIL cadets (97 men) were promoted to the rank of second lieutenant. Because no Royal Decree had come to pass, the KNIL officers of the 1940 promotion soon received the nickname of 'the Kassian lieutenants' ('lieutenants out of pity'). The second year were now cadets-Vaandrig and the first-year cadets-Sergeant. During the war, many KNIL cadets had to continue their studies at regular universities. Seven newly-appointed KNIL second lieutenants, four second-year cadets and a first-year KNIL cadet refused to sign the German loyalty agreement and were immediately sent to German Prisoner of War camps. On May 15th, 1941, they had to report back in the barracks to be checked by the Germans, but they were sent home afterwards. On May 15th, 1942 all cadets had to report again. This time they were not sent home but taken away to a POW camp in Langwasser (Germany), later to Stanislau (Poland) and eventually to Neubrandenburg near Berlin. On April 30th, 1945 they were liberated by the Russians and on May 28th, 1945 they returned to the Netherlands, after which they were temporarily sent on leave. In early August 1945 the KNIL lieutenants and cadets had to report in The Hague. Here they were told that they would be shipped via England to Australia with the first available ship to join the Free-KNIL in Australia. On August 13th, 1945 a group of 160 KNIL lieutenants and cadets united in The Hague in British battledress. Here the group cadets was expanded with a group of KNIL officers who happened to be in the Netherlands during the German invasion. Of the original 243 KNIL cadets of what should have been the promotions of 1940, 1941 and 1942, 194 men would finally reach the Dutch East Indies, including those that had managed to escape during the German occupation. Via the Allied transit camp in Ostende Belgium, the group was transported to Dover, from where the men continued their journey to Malvern Wells in a - by Dutch standards - luxurious English train. Here they arrived in the afternoon of August 14th, 1945. One of the Dutch LSK volunteers, private F.J. Remmers, prepared an interesting diary of his time in Malvern Wells. Remmers had signed up as one of the 400 volunteers for the Military Aviation KNIL and would join the 2nd Company LSK. After a beautiful train journey from Worcester the LSK men finally arrived at Malvern Wells Train Station on Friday July 27th, 1945 at 19.00. When Remmers arrived at the Malvern Wells Train Station, he already suspected that the Camp had to be a Dutch run camp, because the troops had to walk with their luggage from the station to Wood Farm Camp. 'Typically Dutch' he was thinking during the walk. The camp consisted of 4 kitchens, 1 hospital, 1 canteen, 12 large washing facilities and 60 small-to-large barracks. In the Malverns there were 10 other military camps with various nationalities such as British, Canadian, American and Polish. Remmers was housed in Barrack no. 10. 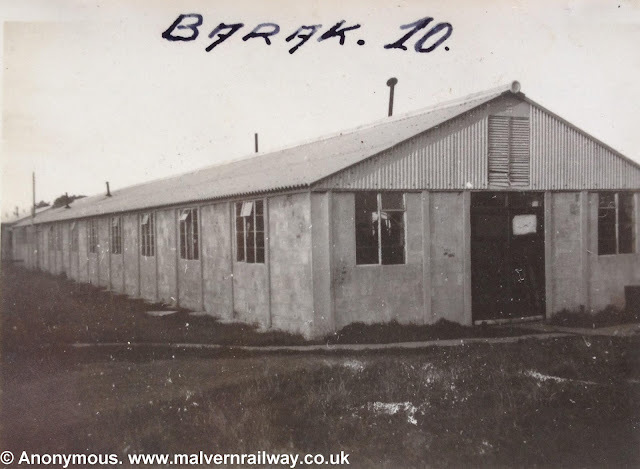 This barrack was set up for up to 40 men, but the standard of the barrack and washing facilities was recorded to be very good. The welcome in the camp was far from friendly; the next morning the camp commander, who didn’t even bother to announce his name, warned the newly-arrived men that they had to behave properly as he would expect from a war volunteer. It was noted that the local beer was stronger than the beer in Holland, and that they should not drink too much of it. A well-trained Indonesian KNIL instructor told them in a loud voice that he would teach them to start eating less. This was clearly an understatement because the men later complained about the quantity and quality of the food in the camp. On Monday July 30th, 1945, the military training for Remmers started with drill exercises conducted by his new section commander Sergeant H. van Swol. As a typical Drill-Sergeant he shouted a lot, and obviously he had never seen such a lousy group of men before in his entire life. On July 30th Remmers would also get his first medical injections. Saturday between 09.00 – 11.00 hrs was typically used for cleaning up the barracks and the camp area. At 12.00 hrs the men were free to go and to leave the camp. Most men went out to look for some entertainment in Great Malvern (3.5 km) or Worcester (18 km). Many visits would follow. On Sunday morning most Protestant men typically attended the weekly Protestant church service in the camp. After arrival in Malvern Wells the troops were not allowed to leave the camp, and it was only after 5 days that the first permission to leave the camp (in Dutch called a “verlofpas”) was granted to Remmers by Sergeant H. van Swol. Anybody reported to be misbehaving outside of the camp would not be allowed by van Swol to leave the camp for a period of one week. Later the more official Verlofpas was issued – permission to leave the camp. After one week Remmers and his mates still had no idea where they had touched down. Friday August 3rd at 17.00 hrs was the first opportunity to leave the camp. He decided to walk to Great Malvern along the main road so they could discover the area. The beautiful countryside made a great impression on the men. Great Malvern was a nice town with two cinemas, a dancehall, a swimming pool and even 4 military canteens. Remmers decided to become a member of first military canteen they discovered, the United Services Club (W.V.S.) on Rose Bank. The membership was only 1 schilling per month, and as a member they would also get one bar of chocolate and 10 cigarettes every 2 weeks for free. The military canteens had been set up as entertainment for the many troops located in the Malverns. Back in the barracks the men would give feedback on their experiences. Some of the men had even made an appointment for the next evening with some local Malvern girls. They started to realise that the camp was not that bad after all, considering that the countryside was beautiful and the locals were very friendly. Daily life in the camp consisted mainly of drill exercises, sport, marches, training in personal hygiene, medical checks and injections, etc. The latter could be very painful in case the injection was placed incorrectly, for example in a muscle. Various soldiers had to be brought to hospital after receiving an injection. Over a period of time each man would get 6 injections. On Saturday afternoon Remmers and his mates would typically travel to Worcester by train. The military canteens in Worcester would then experience a kind of invasion of hungry Dutch soldiers. The food in the canteens was cheap and a lot better than the food at Wood Farm Camp. Large quantities of sandwiches and cakes would then disappear in a very short time, like snow in the sun. During the first visit it took the locals in Worcester completely by surprise and they gave “the Dutchies” the nickname the “Hunger Army”. The locals found out later that it was because of the poor food at Wood Farm Camp. 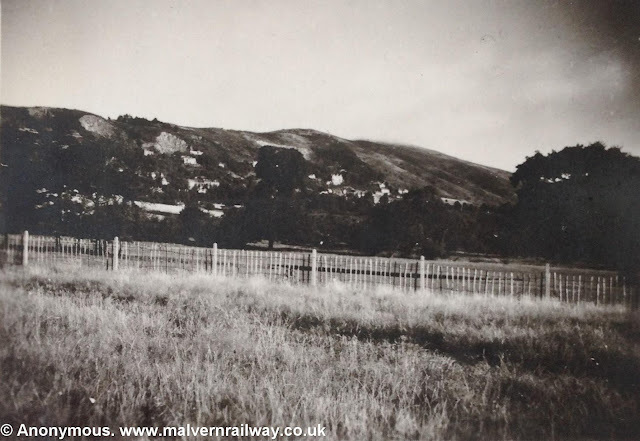 In the evening the men would take the train back to Great Malvern, from where they had to walk back home because there was no train from Great Malvern to Malvern Wells in the evening. The life in Wood Farm Camp was starting to become boring. The LSK men would perform a daily march of approx. 4.5 hours through the beautiful surrounding countryside, visiting places like West Malvern, the Malvern Hills and Great Malvern. On one occasion the men walked to Worcester (18 km) and took the train back to Malvern Wells. Remmers' diary also contains various bus tickets for the Birmingham & Midlands Motor Omnibus Co. Ltd.
At Wood Farm Camp, the residents received the news of the unexpected surrender of Japan on August 15th, 1945 due to the atomic bombs at Hiroshima (August 6th) and Nagasaki (August 9th). Now the wildest speculations arose about the destination of the Europa Detachment of the KNIL. The KNIL officers and cadets, most of whom had been born in the Dutch East Indies, wanted to go to the Dutch East Indies as soon as possible in order to check the fate of their family in the Japanese internment camps for European citizens. However, this was impossible because the Dutch Government did not have its own shipping space and had to wait for the Allied shipping pool before a large ship was made available. For Remmers and his mates the Japanese surrender meant 2 days holiday and celebrations in town. The food and drinks in the cilitary canteens was free, so the soldiers enjoyed themselves. Soldiers of various nations would mingle and celebrate together in town. For many the Coca Cola drinks in the American canteen were a new experience. Remmers recorded, obviously with pride as a young man, that the Malvern Gazette had printed in bold letters in the evening edition that the Dutch had set the tone and had made it a great celebration. New troops were still arriving at Malvern Wells. 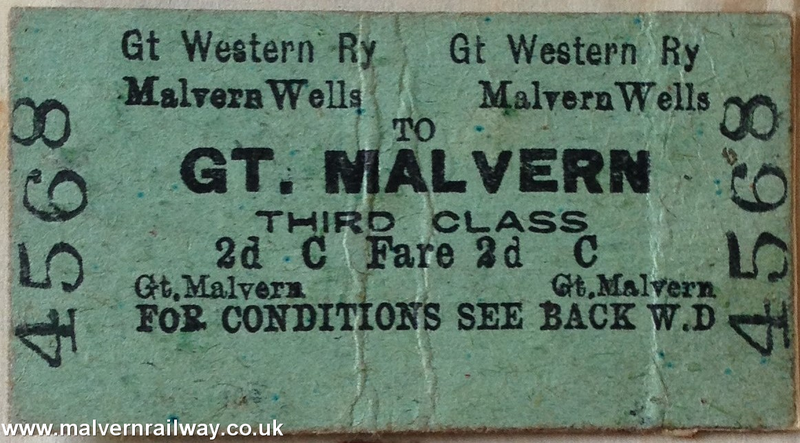 On Friday August 17th at 04.00 hrs in the morning 1,200 soldiers of the GBI (the so-called second GBI detachment) finally arrived by train at Malvern Wells. After a walk to the camp most of them had found a bed at 05.30 hrs. It seems that some of these men (or all) were later transferred to Blackmore Camp on August 29th. This was an army camp in the countryside 20-30 minutes walking distance from Malvern Wells. In the meantime the Australian Government was starting to pull back her support for the Dutch, as she was against the re-installation of Dutch colonial rule in a post-war Indonesia. Unlike the previous Australian welcome for the first GBI detachment, it was unknown when the Europa Detachment KNIL would be able to leave for Australia. Eventually, the group had to wait another seven weeks in Malvern Wells before the green light to leave was given. The transit camp was never intended for a long stay. The facilities to offer a complete basic army training were limited, and a useful way of spending of the time had to be found. The KNIL-Cadet Company under command of KNIL Captain F.M.F. Claassen was made available for the task to lecture the GBI and LSK in Indonesian culture and ethnology, Malay language, marching and drill exercise. The latter however was unarmed, because the weapons were indented to be provided in Australia from KNIL stocks that had been created there during the war. On Saturday August 18th the usual gathering started at 08.30 hrs. In the afternoon a new uniform (Canadian), 2 sets of tropical outfits and 2 sets of brown boots were issued to the GBI troops, followed by a medical check. 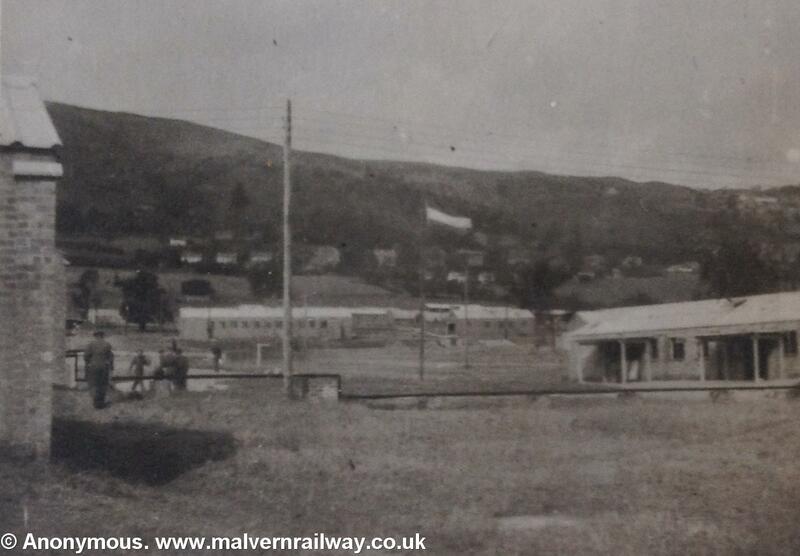 In the evening most newly-arrived GBI soldiers went to Malvern to discover the town. It was a surprise for many to see children begging for money in the streets of Great Malvern. 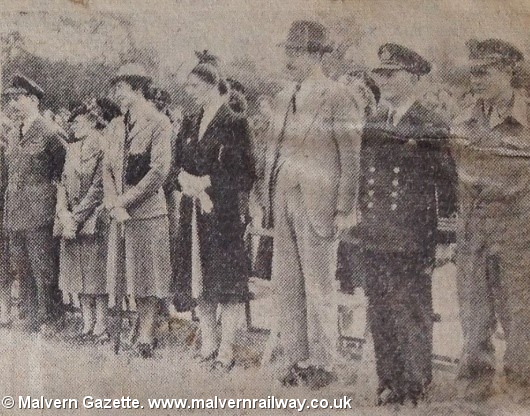 With the Malvern Hills as a background and British civilians as spectators, the Dutch Forces at Malvern Wells celebrated “Holland’s Day”, the 65th birthday anniversary of Queen Wilhelmina. This ceremony was observed by the Dutchmen for the first time in five years, and for the first time on foreign soil. The Dutch flag fluttered over the former US hospital camp, and another flag was used for a swearing-in ceremony of 39 young Dutch officers, former cadets of the KMA (Royal Military Academy) in Breda, who had been unable to take the oath in Holland because of the German occupation. They had all been in German concentration camps or had been members of the underground movement, and their courage during the years of enemy occupation was recognised in a speech by their Commanding Officer, KNIL Lieut.-Colonel of Engineers G.W.J. van Walraven, who said they had already given evidence of their loyalty to their high Sovereign Lady, the Queen. The officers each held the flag in their left hand, and gave a salute with two fingers of the right hand, almost a Victory V sign, as they took the oath. One officer took the oath on the right of the flag because of requirements of his religion (he was a Muslim), and another promised, but did not swear, also on religious grounds. The Commanding Officer then called for three cheers for the Queen, which were honoured with enthusiasm. Afterwards the KNIL Lieut. Colonel of Engineers G.W.J. van Walraven took the salute at a march past of units headed by the band of the 1st Battalion Worcester Regiment, who also played the Dutch national anthem, the men following with a spontaneous cheer. Then the commanding officers and officers entertained the British spectators in their mess, when the company toasted on the health of the Dutch Queen. Amongst those present was Lady Somers and her daughter from Eastnor, Lt.-Cl and Mrs. Mackie and miss J. Mackie, Col. And Mrs J.B. Wheeler, Mrs Bernard Hill and commander WL Murmann and Flt.-Lieut. J Cogill. The rest of the day was observed as a holiday and the soldiers were free to leave the camp. The Dutchmen were seen in public to be wearing orange and red, white and blue favours on their uniforms. In the evening the young Dutchmen gave a dance for Malvern residents at the Clarence Road Drill Hall, which was a happy function. There was also an informal dance in the Welcome Club and the next morning the Dutch boys who enjoyed it sent the warden flowers and a word of thanks for making the their Queen’s birthday so happy for them all. On Saturday September 2nd, 1945 the Commanding Officer G.W.J. of Engineers van Walraven expressed his appreciation in front of the troops for making Queen’s Day a success. He added that he was convinced that the troops would meet the high expectations of the KNIL after their arrival in Australia. During the month of September, lieutenants and cadets were busy lecturing and training the GBI and LSK in and around the Wood Farm Camp. In September the soldiers even had enough time to help the local farmers for 4 shilling per man to cut the wheat or collect the hops. It surprised them to see that the farmers were all using tractors, when most farmers in Holland were still using horses. In September many visits to the local farmers would follow so they could earn some useful shillings. Also, the contact with the local women seemed to be good as this even resulted in some marriages as indicated below. In this period there were still some late arrivals of cadets joining the detachment. On September 14th, during the raising of the Dutch flag in Wood Farm Camp, KNIL Captain F.M.F. Claassen addressed the troops by indicating that after five years of suppression the flag was still there and had been a source of inspiration for them all. He indicated that the troops should think of this flag at all times. This flag would also be back again in the Dutch East Indies and make them all proud. In the Dutch East Indies the return of this flag would be of great symbolic importance. On Saturday September 15th it was announced to the troops during a special gathering at 21.00 hrs that the departure for the Dutch East Indies would not be far away. On Sunday September 16th, everybody got up early for a march starting at 08.30 hrs to the church in Worcester to attend a memorial service. During the service a word of appreciation was spoken out by the Dutch, that in September 1940 the German attack was halted and that the British played a significant part in the liberation of Holland. After the service there was a military parade in Worcester with soldiers from various nations participating. On Saturday September 29th food was provided twice. The second issue was already at 10.30 because the troops had the afternoon off. To prepare themselves for the long journey in the coming week, many took the bus to Gloucester for shopping. All kinds of items were purchased here, like cigarettes, soap, letter papers, souvenirs, etc. items useful for the journey. At the start of the evening the money had run out and most took the train back to Great Malvern which arrived at 21.30 hrs. On Sunday October 1st , 1945 the last church service in England was held. Obviously the service was related to the upcoming departure for the Dutch East Indies. The next morning food rations were provided twice and a field exercise in anti-guerrilla warfare was conducted. That evening would be the last one in which the troops could leave the camp. On Tuesday October 2nd it was announced that the troops would leave in the next day. On October 3rd after the usual gathering in the morning, the residents of Wood Farm Camp had to return goods such as blankets, etc. At 15.30 hrs there was a second gathering before 2,400 Dutch residents marched off to the Malvern Wells train station. At 18.00 hrs four trains left for the Dutch Army camp in Wolverhampton, where they would arrive at 19.30 hrs. At midnight the train arrived at Liverpool with 1,600 troops of the GBI and LSK from Wolverhampton. With doubledecker buses the troops were then transported to the Canada Dock, where at 01.45 hrs they would board the British troopship “Stirling Castle” with 3,000 Australian and New Zealand RAF soldiers already on board for repatriation to their homeland. On October 4th the Stirling Castle left Liverpool with Australia as final destination. On arrival in Australia the Australian Government did not allow the Dutch troops to disembark, and the journey had to be continued on the “Morton Bay” with the destination of Java. Finally the troops arrived at Penang, British Malaya because the British Authorities on Java didn’t allow the Dutch troops to disembark in Batavia. After 54 days on board of various troopships, the men and women could finally go on land. It’s not clear when the Dutch stopped using Wood Farm Camp, but there is a newspaper recording the Dutch Government making use of the camp in January 1946. Furthermore I would like to know more about the presence of Dutch troops in Blackmore Camp. I hope that elderly citizens of the Malverns who still remember the Dutch are willing to share this with me by providing useful verifications, additional information or photos. Many thanks to Martin Theaker, who has been so kind to offer me to help by publishing this account of events on his weblog. In case of any comments please use the comment function below. Thanks in advance ! • Koster, L.P., With the LSK to the Far East (Private Edition 1988). • Hartog, Leo de, Officieren achter prikkeldraad (Baarn 1983). • Memorial book Korpps Beroepsofficieren KNIL 1940-1950, edition Dutch East Indies Officers' Association (Amsterdam, Z.J.). • Article of Major BC Cats on KMA Cadets promotions 1940, 1941 & 1942. • The Malvern Gazette, article on Queen’s Day August 31, 1945. • De Heerenveensche koerier, 14-09-1945. 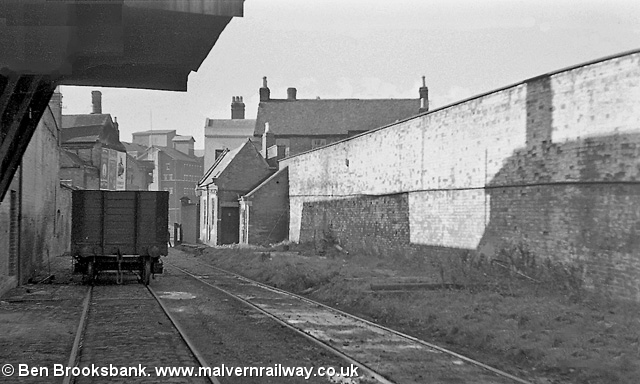 For this week's blog post we return to the Tewkesbury Quay branch, the small 'branch within a branch' that ran from the Malvern-Ashchurch line down to Quay Street in Tewkesbury. This tiny line is really interesting when compared with the genteel country nature of the rest of the route, featuring as it did trains running through industrial and urban areas, as well as sections with on-street running. By far the best part of the Quay branch, however, was the evocative engine shed with its cobbled road and high brick walls. These pictures by Ben Brooksbank are among my favourite shots of the whole railway, so enjoy! As a small aside, I have noticed in the last couple of days that 'Britain from the Air' have recently recatalogued all of their photographs. This has broken all of the links on my page to their shots, so please bear in mind while I track down and restore these resources over the next few days. 'Tewkesbury Old Station: View SW along Mill Branch towards High Street (level) crossing and Healing's Mill, showing remains of the original (1840) Tewkesbury Station'. Used under licence via Creative Commons 2.0. 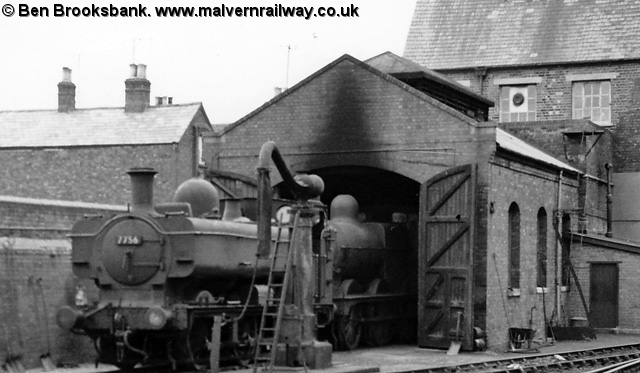 'Tewkesbury Engine Shed: The small engine-shed, on the Mill Branch, with two occupants: ex-GWR '57XX' class 0-6-0PT no.7788 (built 12/30, withdrawn 7/62), behind it an ex-MR 3F 0-6-0'. Used under licence via Creative Commons 2.0. 'Tewkesbury Engine Shed, with a Midland 0-6-0 prominent: View eastward, towards Tewkesbury Junction and Ashchurch. The line is the original (1840) branch from Ashchurch to the terminus by the High Street that closed to passengers on 16/5/1864, when a new station was opened on the line to Upton-on-Severn and Great Malvern. Ex-Midland 3F 0-6-0 No. 3604 dominates the scene; ex-Midland 1P 0-4-4T is just outside the little shed'. Used under licence via Creative Commons 2.0. 'Tewkesbury Engine Shed, with a Midland 0-4-4T: View eastward, towards Tewkesbury Junction and Ashchurch. Ex-Midland Johnson/Deeley 1P 0-4-4T No. 1338 is beside the makeshift 'coaling stage''. Used under licence via Creative Commons 2.0. 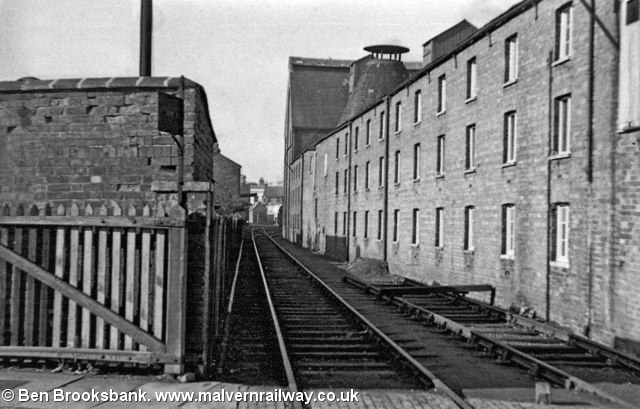 'Tewkesbury Quay branch: View westward from near Tewkesbury Junction, towards the Engine Shed, Old Station and across the High Street to the Quay. The branch was closed in 12/57, some years before the line through the 'New' station to Upton-on-Severn closed in 1961'. Used under licence via Creative Commons 2.0.